Just when there seems to be something to celebrate, the Carolina Panthers prove you wrong again. The Panther’s loss last week to the NFL’s worst team, the Kansas City Chiefs, just goes to show that despite looking like they have everything figured out, the Panthers are far from it. Ron Rivera’s job hangs on the edge of termination a little more with each passing week. The Panthers are 3-9 on the season and have only recorded wins against teams with losing records. Statistically, this week’s matchup against the Atlanta Falcons doesn’t bode well for Carolina. Atlanta shares the NFL’s best record at 11-1 with the Houston Texans. The Falcons have not lost a game against Carolina since week 10 of the 2009 season; the leading receiver for that game was Muhsin Muhammad. Carolina will be charged with stopping the league’s fourth-best passing attack anchored by Roddy White and Julio Jones, two receivers that have paired up for nearly 2,000 yards and 10 touchdowns throughout 12 games. Michael Turner has not had a stellar season but the last time the two teams met, Turner compiled 103 yards on 13 carries. Last week Carolina was not able to force any turnovers against the Chiefs, a pattern that they will have to change if they want to beat their division rivals. As for the Carolina offense, they will have to continue to play mistake-free and hope that the defense can hold their ground. Cam Newton has thrown for 790 yards, six touchdowns and zero interceptions in his last three games. In two of the last three games, Newton has lead the team in rushing yards as well. The Falcons don’t feature a highly-touted defense, although they did force Drew Brees to throw five interceptions last week. 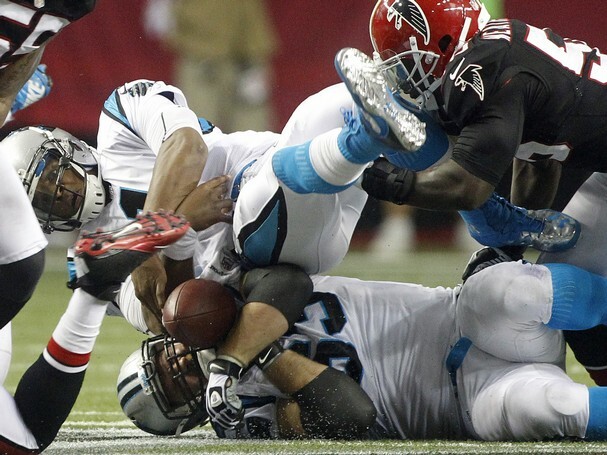 Carolina will have to establish a running game against the Falcons if they want to win. Steve Smith will also need to be more involved with the passing game like he was against Kansas City. Last week was the first time that Smith caught a touchdown and earned more than 100 yards in one, all season. Carolina has their hands full with the playoff-primed Falcons, but could play spoiler and expose some of the weaknesses the Falcons show just in time for their postseason run.